Just days before Congress adjourns for October recess, the word among lobbyists was that a proposal for flood recovery funding for Louisiana would not even get a vote for inclusion in the continuing resolution (short term budget). It was the last opportunity to secure funding for flood recovery before the lame duck session. Then, according to Together Baton Rouge (TBR), sister IAF organizations across the country began contacting their congressional representatives and senators urging them to support the funding package â€” across partisan lines. Together Baton Rouge posted a video that, in less than one day, was viewed 55,000 times as leaders quickly spread its message urging people to contact their congressional representatives. Before a packed house of leaders from Together Louisiana, and after eight intense rounds of public testimony, the Louisiana Board of Commerce and Industry voted to defer all renewal applications for industrial tax exemptions, including an application for property tax breaks by Koch Industries which would have cost (disaster-declared) East Baton Rouge Parish $1.9 million in revenue. With questions and concerns about the Housing Trust Fund and One-Cent Sales Tax, 300 leaders of Working Together Jackson packed an Emmanuel Baptist Church hall to engage Mayor Yarber around their concerns. Said Dorothy Triplett, a leader of St. Andrew's Episcopal Church, ""We are a very different organization, a very grassroots organization that doesn't just complain and talk about the problems. We come together with our people and ask what are you willing to work on. And we will also be talking about our vision as we move forward for the 2017 municipal elections. We hold all of the candidates accountable." "Interfaith members who met with The Times editorial board last week, said their interest in this legislation is about helping consumers avoid entering a debt loop they often find it difficult to escape from. Interfaith and other organizations around the state have joined forces as "Together Louisiana" to highlight the matter before the public and lawmakers. 'We are not asking that the payday industry be outlawed,' Interfaith members stated in a news release. 'Banks and credit unions have a cap on the number of loans one person can receive. We do not think it unreasonable that the payday industry should adhere to the same rules.'" 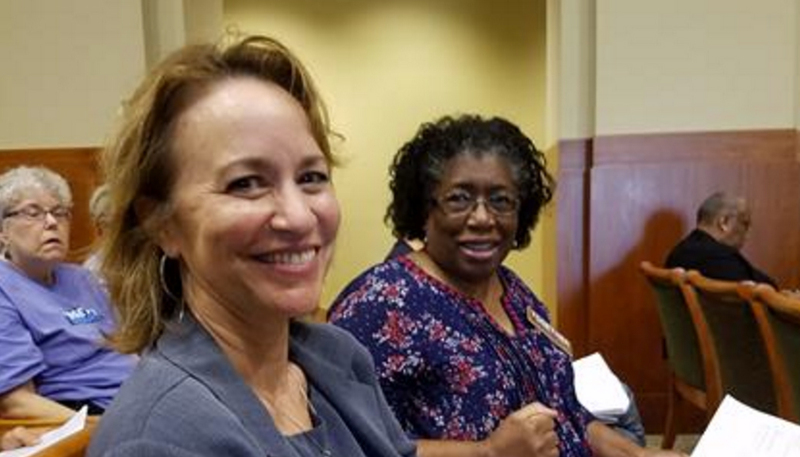 With the press calling it "the sleeper issue of the session," leaders from 'Together Louisiana,' stormed the Capitol to testify in Committee hearings and weigh in on legislative debate over how to address payday lending in Louisiana. 'Together Louisiana' leaders assert that payday lenders able to charge interest rates ten times higher than felony loan-sharking laws currently allow, making them "legal loan sharks." They want a cap on the annual interest rate for entering into short-term loans and are working with legislators to get one, in partnership with in partnership with Habitat for Humanity, AARP, the Conference of Catholic Bishops, the Louisiana Budget Project and the Southern Baptist Convention.